Shopping centres generally hold little appeal for me. 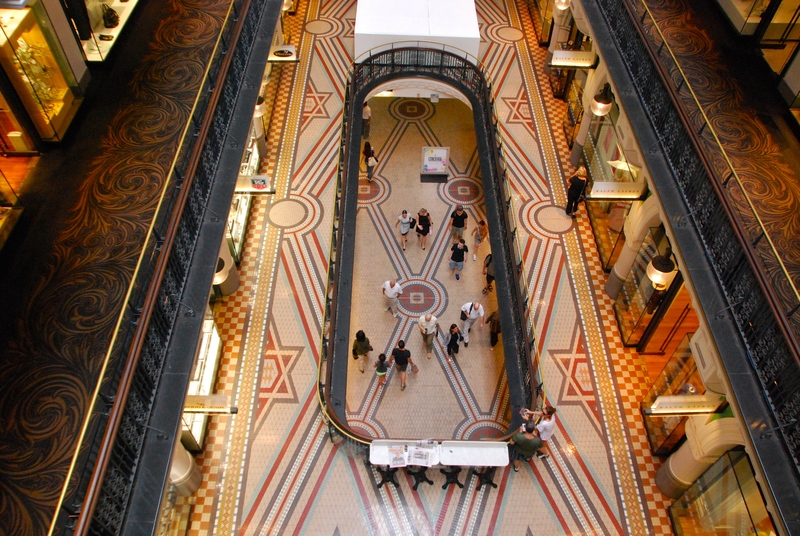 But there are exceptions, and one of them is Sydney’s gorgeous Queen Victoria Building (affectionately called the QVB). Whenever I’m in the “big smoke” I like to linger here and admire the architecture, have a coffee and watch the world go by. Shopping? Well, maybe, but it’s not central to the experience for me. The QVB, my choice for this week’s travel theme challenge “Centre”, was built in 1898 as a monument to mark Queen Victoria’s Jubilee. It’s the elaborate result of a host of craftsmen being brought together in a bid to employ them during the Great Depression. And the results are spectacular, helped along by a massive restoration project in the 1980s that gave Sydney-siders and visitors this fabulous creation. 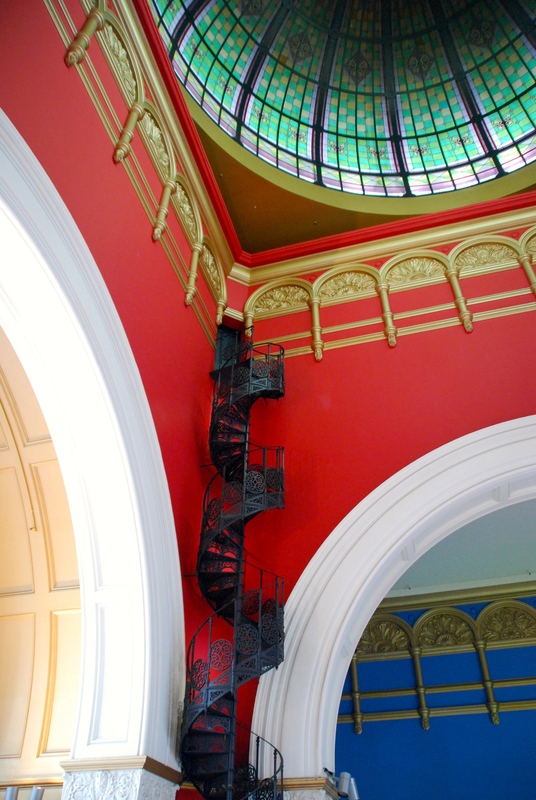 The central feature is the massive copper dome, with an inner glass dome, but everywhere you look there are beautiful features: glowing stained glass windows, arches, pillars, balustrades, tiles and even an original staircase. 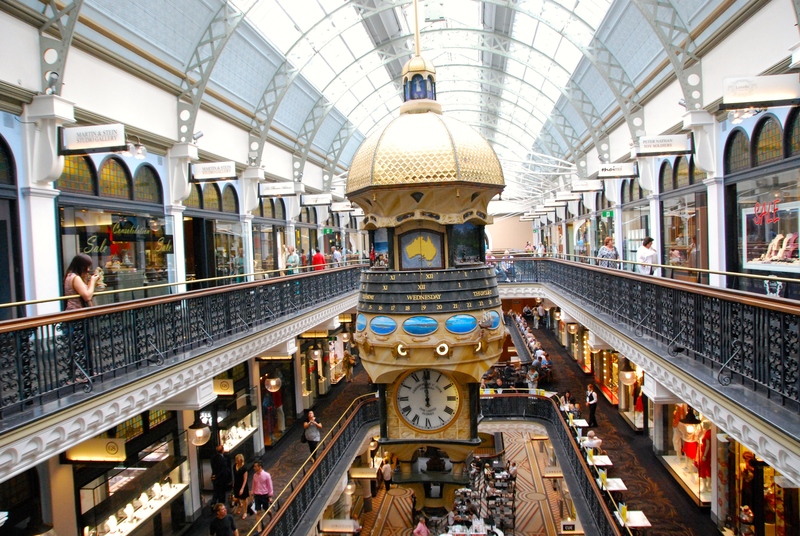 And I love the central clock, with its map and other bits of Australiana. 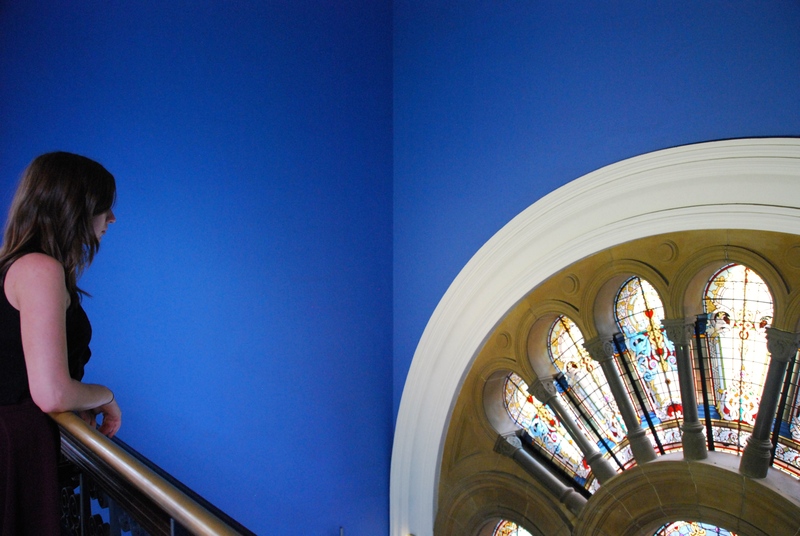 Guided tours of the building are available three mornings a week, on which you can learn about the building’s somewhat chequered history and learn about all its special features. 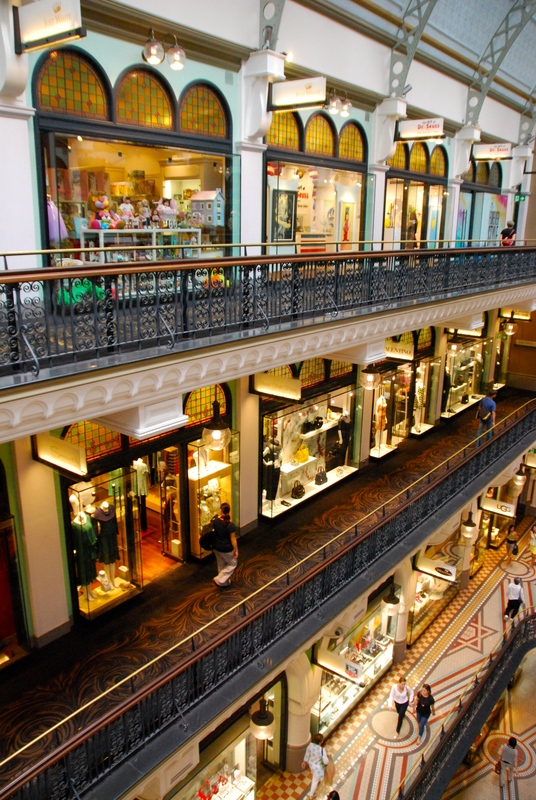 Or if you prefer, just sit in a cafe (there’s free wi-fi in the building too), or shop-till-you-drop. Oh yes, it really is! Love these photos, Lee. And I agree. It really is a beautiful centre, isn’t it? Yes, I always like to stop in if I’m in the city in Sydney. It certainly is a magnificent edifice, isn’t it? I enjoyed wandering through a couple of times on our recent trip to Sydney. Hope you didn’t blow the travel budget in there, Penny! But whether you buy anything or not, it’s great to see. That’s my daughter Jess gazing at the stained glass windows. Such a unique gem in Sydney. 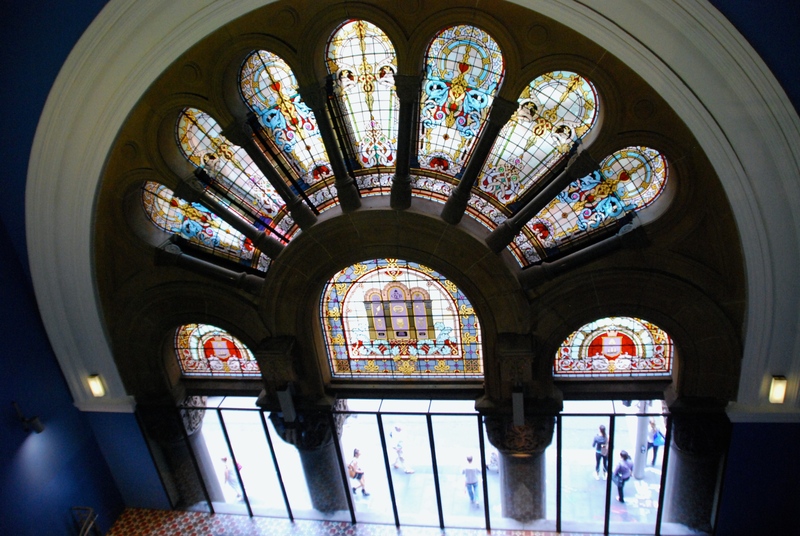 Yes, it’s wonderful – and so great that it was saved from dereliction.